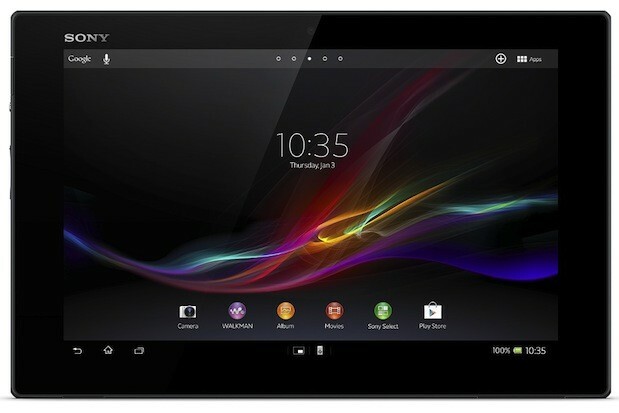 Sony got itself some records to hold by showcasing the latest Sony Xperia Tablet Z the worlds thinnest 10.1" Android Tablet running Android 4.1.2 Jelly Bean in the ongoing Mobile World Congress. This tablet will be available in both 16GB and 32 GB while White and Black being the selective colors and can be bought at Sony stores.The 16Gb model is priced at $499 and the 32GB costing some $100 more. Worlds thinnest tablet just 6.9 mm thick and measuring 495 Grams making it a lot comfortable and easy to carry around. Good 10.1-inch Full HD Reality Display at a screen resolution of 1920 x 1200 pixels. The tablet is dust and Water Resistant. Snapdragon S4 Pro processor with 1.5 GHz asynchronous quad-core CPU and 2 GB RAM making the tablet blazing fast. 8 MP rear camera with Exmor R for Mobile image Sensor and Superior Auto plus 2MP HD front camera.